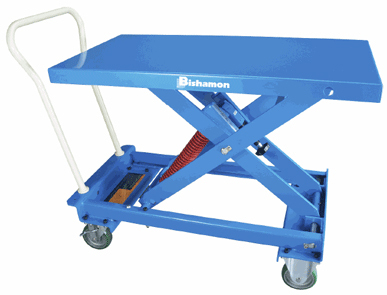 ESX Series MobiLeveler® work positioners are fully adjustable, weight sensitive, self-leveling mobile work positioners. They improve efficiency and help prevent injury by bringing the top of the load to a convenient working height. An easily accessible control knob provides infinitely adjustable weight settings within the capacity range. ESX-10 15.8″ 66 / 220 10.4″ / 26.2″ 17.8 x 27.6″ 17.8 x 33.3 x 31.3″ 90 lbs. ESX-21 16.6″ 175 / 460 13.8″ / 30.4″ 19.8 x 32.3″ 19.8 x 40 x 35.5″ 170 lbs. ESX-40 16.6″ 220 / 880 14.5″ / 31.1″ 20.5 x 39.8″ 20.5 x 48.5 x 35.5″ 280 lbs.